Grains mixed in the overnight session. Currently wheat is unchanged, corn is up ½ cent, and beans are up 4 cents. The G20 eco summit meetings in Buenos Aires begin Nov 30th. US says it is prepared to impose/increase tariffs on all remaining Chinese imports if no deal is reachable. Black Sea region tensions continue with Ukraine considering ‘martial law’ in response to the Russian’s naval advances. The UN Security Council scheduled in emergency meetings yesterday. The Russian blockade was lifted, but uncertainties remain. USDA weekly export inspections for corn totaled 43.9 mil bushels, for beans totaled 40.6 mil bushels, and for all wheat totaled 9.2 mil bushels. USDA weekly progress report had winter wheat planted at 95%, compared with the 5-year average of 99%. Winter wheat ratings declined 1 pt to 55% G/E. This will be the final ratings for 2018, and will resume the first of April. 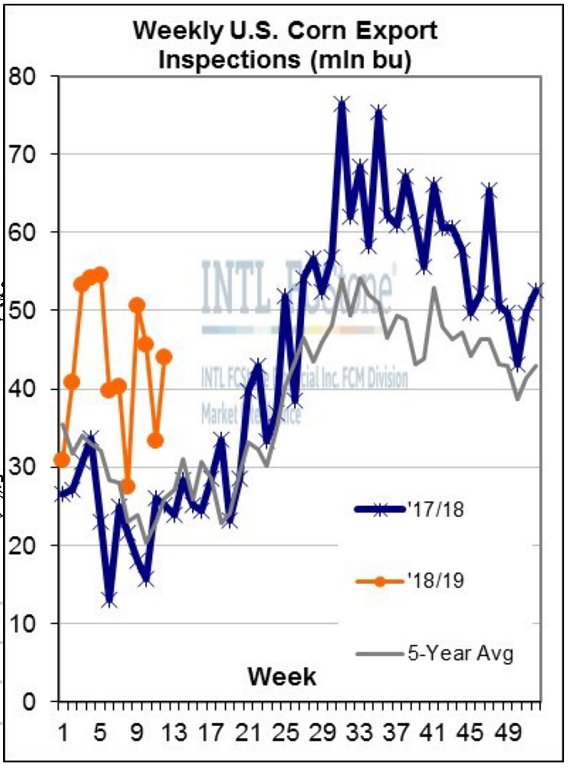 Corn export inspections rebounded solidly to an even 44 million bushels on the week ending last Thursday (11/22), above the trade estimate range, up from 33.3 mbu the week prior, and well above 25.2 mbu on the comparable week last season. Cumulative corn inspections stand at 516 mbu, already 229 mbu behind last year’s pace through less than one-quarter of the 2018/19 marketing year, with the USDA looking for a minor (+12 mbu) YoY corn export increase.